NEW YORK (AP) - Bill O'Reilly wants to rap with Jon Stewart. The host of Fox News Channel's "The O'Reilly Factor" has invited the host of Comedy Central's "The Daily Show" as a guest Monday. Fox News said Friday that O'Reilly and Stewart will debate the invitation for Grammy Award-winning rapper Common to perform at a White House poetry night this week. O'Reilly has criticized Common's presence at Wednesday's event. He says some of Common's lyrics celebrate violence. Common is known for socially and politically conscious rhymes. He was on his best behavior at the White House. He took the criticism in stride and tweeted, "Fox News doesn't like me." He added on Facebook, "Peace yall!" Stewart let loose with an anti-Fox News Channel rap on his show. 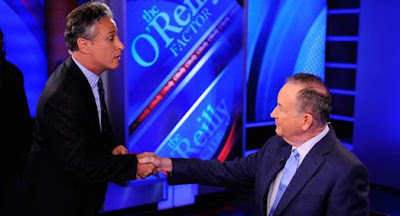 The O'Reilly-Stewart faceoff airs Monday.